During a group panel presentation at Messalonskee Middle School Friday morning, several religious representatives stressed the commonalties their faiths share. 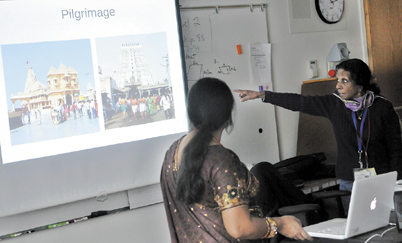 OAKLAND — When three Christians, a Muslim, a Buddhist, a pagan, a Jew and a Hindu walked into a classroom, it wasn’t a setup for a joke — it was a joint effort to teach a new generation about cultural respect. “I grew up in a generation of people that were told that we should never discuss in polite company topics such as politics and religion,” teacher and organizer Elizabeth Firnkes told a group of sixth-graders at Messalonskee Middle School Friday morning. During a group panel presentation, many of the religious representatives stressed the commonalties their faiths share. During the program, a rare example of young public schoolchildren being taught about religion, panel members fielded questions on how they observed their faiths in daily life and whether they had been teased or bullied because of their religion. Carl Eric Robbins, a pagan who grew up in Sidney, said that students who identify themselves as pagans are often misunderstood by their peers. “They face a lot of teasing because there is a lot of misunderstanding,” he said. However, Roberts said, paganism’s natural irreverence helps to deflect the harm. “It’s part of our belief that we don’t take ourselves too seriously,” he said. The program received funding and leadership from the Pearson Foundation, which runs a model classroom program that sponsors exceptional educational programs. Foundation representative Brian Burnett said the program selects classroom projects that encourage student development in innovative ways. Instead of a traditional teacher-student relationship, Burnett said, the program emphasizes coaching students through projects. Many students in attendance had roles beyond that of passive listener. Student questioners sat on the panel and a student moderator handled the microphone. Others busily snapped pictures and recorded videos for a documentation project. After a group discussion, students made individual decisions about which panelists they would like to hear more from in smaller workshop sessions. Buddhist Peggy Smith had only a handful of students choose her during the first of three sessions, but the students who left gave such glowing reviews that there was standing room only for the second session. Smith fielded questions on everything from hunting to vegetarianism to abortion, and she also led the children through meditation exercises. Kat Stevens, 12, said she was never able to meditate in the past, despite encouragement from her mother. “I thought I couldn’t focus, but I noticed that in her presentation I found a way to meditate that made it much easier for me,” she said. Stevens found a separate session led by Muslim Ghassan Saleh to be equally helpful. “I didn’t know about their holidays, and I thought their holidays were really different — not weird, but different, because I think different is really nice,” she said. Stevens and Seth Main, 11, said that before the program, they mostly associated the Muslim faith with terrorism. “Because what happened on 9/11, I used to think that Muslims were bad. But my parents kept telling me that they’re not, all Muslims are not bad, just those people who decided to do bad things,” Main said. However, he said it took a session with Saleh for him to understand differences and similiarities among Muslims and Christians, who, along with Jews, all share the belief in one God. Sometimes the children sought to satisfy their curiosity about the small, intriguing details that distinguish members of one faith. “When I start a prayer, I precede the prayer with washing my hands, my face and my feet,” Saleh said, noting that Muslims wash those body parts five times a day. A trio of 12-year-old girls, Jaylynn Drown, Megan Smith and Kelly Brown, focused on the traditional yarmulke worn by Rabbi Hillel Katzir. “I thought that they clip it, but they Velcro it,” Drown said. At other times, they were focused on the big questions. Brown said that before the session, she had basic misconceptions about Jews. “I thought that they were like, quiet people who didn’t talk a lot and that they were really shy, and that they were afraid of how people thought of their religion and what they believed in,” she said. After the session, she said, she realized that Jews can be as open about their faith as anyone. The project was done in collaboration with Interfaith Maine, a nonprofit that works to deepen interfaith relationships. Other participants included the Rev. Jack Dickinson, a Roman Catholic priest from the Diocese of Portland; the Rev. Thurlow Smith, a Baptist minister from Augusta; Methodist Pushpa Harding, who grew up in India; and Hindu Janaki Shanmugam.